These are Anaglyph DVDs that depending on title use the red/cyan or green/red type glasses. Each include at least 2 pairs of cardboard anaglyph glasses. These titles work best with HDTV's because they have better color reproduction than standard definition TVs. They will also work well on computers. Please note, than unlike our interlaced DVDs these DVDs are coded for Region 1 and may not play on DVD players outside of the US and Canada. In this all new 3D remake of the popular 1968 horror classic, Barb and her brother Johnny arrive late for the burial of their aunt and walk straight into a nightmare! With zombies on their heels, Barb flees the cemetery and is rescued by Ben, a local college student. The two seek refuge in the nearby farmhouse of the Cooper family, where the laid-back residents aren't remotely prepared to have their lives turned into a horror movie. Barb is destined for an even grimmer confrontation...with the dark secret of the pyrophobic mortician, Gerard Tovar, Jr!. 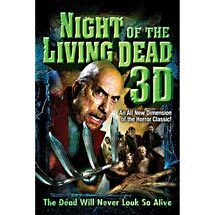 Audio Commentary with Director Jeff Broadstreet, Screenwriter Robert Valding and Actor Sid Haig; "Night Of The Living Dead 3D" Behind-the-Scenes Featurette; Q & A with the Filmmakers and Actor Sid Haig at the New Beverly Cinema; Filming in 3-D: A Behind-the-Scenes Special Look; TV Spot; Radio Spot; 3-D Still Gallery, Behind The Scenes Featurette, Blooper Reel, Director Commentary, Trailers. Note: This Feature uses Anaglyph where the right lens is red instead of the left. Although our paper glasses will work by folding them in the opposite direction, and the included glasses will work (4 pairs are included with the feature), our plastic anaglyph glasses will not work with this DVD. Warning: This product is intended for mature audiences only. It may contain violence, sexual content, drug use and/or strong language. You must be 17 or older to purchase this item. By ordering this item you are certifying that you are at least 17 years of age. 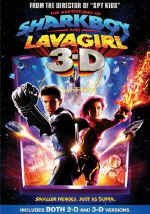 Another family adventure from the hit-making director of SPY KIDS(TM), THE ADVENTURES OF SHARKBOY AND LAVAGIRL is nonstop fun and stars Hollywood favorites David Arquette, Kristin Davis, and George Lopez. Everyone always knew that Max had a wild imagination ... but no one believed that his wildest creations -- a boy raised by watchful great white sharks and a girl with the force of a volcano -- were real! Now, these two pint-sized action masters will show Max that even an ordinary kid has what it takes to be extraordinary! Bursting with cool, eye-popping 3-D special effects -- even the smallest dreamers can become the biggest heroes in this entertaining motion picture! Contains both 2D and 3D Version! Remember this is the the red left cyan right anaglyph version! This is red cyan anaglyph and will work well with all our other 3d anaglyph glasses. Click here for the shutter glasses version. The Spy Kids are back again! This time, their trademark action is combined with the very latest digital technology and the thrill of the 3-D experience to deliver a motion picture event that pushes family fun to the next level! Secret agents Juni (Daryl Sabara) and Carmen Cortez (Alexa Vega) set out on their most mind-blowing mission yet: a journey inside the virtual reality world of a 3-D video game where awe-inspiring graphics and creatures come dangerously to life! As they face escalating challenges through increasingly difficult levels of the game, the Spy Kids must rely on humor, high-tech gadgets, and the bonds of family in order to stop a power-hungry villain (Sylvester Stallone) set on controlling the youth of the world! Also featuring familiar faces Antonio Banderas, Carla Gugino, and Ricardo Montalban in an incredible all-star cast! Remember this is the the red left cyan right anaglyph version! This is red cyan anaglyph and will work well with all our other 3d anaglyph glasses. Click here for the shutter glasses version. Director's commentary and optional French or Spanish audio.